John Unger cradling his beloved senior dog Schoep in the calming waters of Lake Superior to help alleviate his arthritis. Schoep lived to the ripe old age of 20. That was a wonderful article about grief and dogs. I have been through it three times unfortunately. You’re right it can’t be much more difficult than losing a human loved one. I can tell from your profile as well as your article that you are a wonderful human being and there should be more like you in the world. I lost my precious Reba 6 months ago, my grief is still so profound, and yes more so than it was after the loss of friends and family. She was the reason I hurried home , after her death I found myself so lost. Even now, I can’t think about her without crying. This is very true. Not a day goes without me mourning over my Goofy. Its just 5 months and his crossing the Rainbow bridge has left a huge void in our lives. 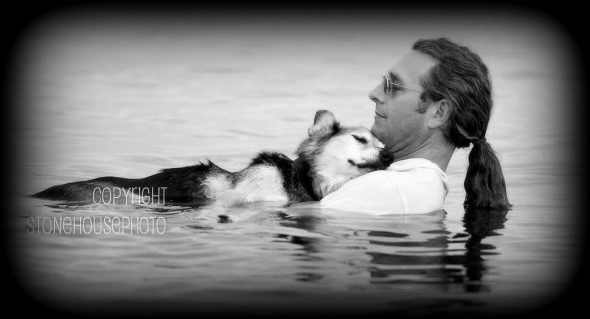 Truly one of the most painful experiences in life is losing a beloved dog. But wonderfully, what one discovers when the grief lessens, is that the love remains. It’s yours to keep forever, and is just one of the many gifts our dogs give to us. I had my boy Finn just short of 12 yrs. I got him when he was 10 weeks old. When my partner left… I told her she could have everything but Finn. On June 6th 2016 I kept my promise to him. He blind and for 3 weeks before I would carry him outside to go potty every hr. Then I thought I was being selfish. Well I sang “you are my sunshine” like I did for every thunderstorm . The 2 words the vet said will stay with me forever ” he’s gone” . But I was holding him in my house on his couch. Thank you for this article… there is NO SUCH THING AS JUST A DOG!!! Someone once said that the only thing wrong with a beloved dog, is it’s lifespan. Thousands of wondrous times, one terrible day. The same can be said for birds. I lost my precious Marcie suddenly last year to an infection. There’s not a day that goes by that I don’t tear up just thinking about her. I saved her from immediate death and nursed her back to health–it took over a year to do that. No person could be as close as Marcie was to me. That bond can never be broken. Thank you for the affirmation of our grief over our pets’ passing. Well said all of you. The only way I can get over the loss of Buster and many more before him is to find or let them find me, is to take another one home. We can’t let them be alone. I know we have love can help someone. My hart was broken when i loss my first Dog (which name was Jack)……still now i miss him.. When I was a kid, I raised a dog. When IT died, I cried …! It is so heartbreaking when someone loses their dog. I have lost my 16 years old dog and he was with me all the time, i still miss him and no other dog can take his place. It´s very difficult to lose a pet. They are with us for many years and can be our best friend. They travel with us and live with us. They keep us company when we are lonely and feeling down. They are happy with us when we are happy. They are great friends. I have also lost a dog. It´s a terrible experience. He was like a member of the family. We had him for years. It was especially difficult for the children. They cried for days. 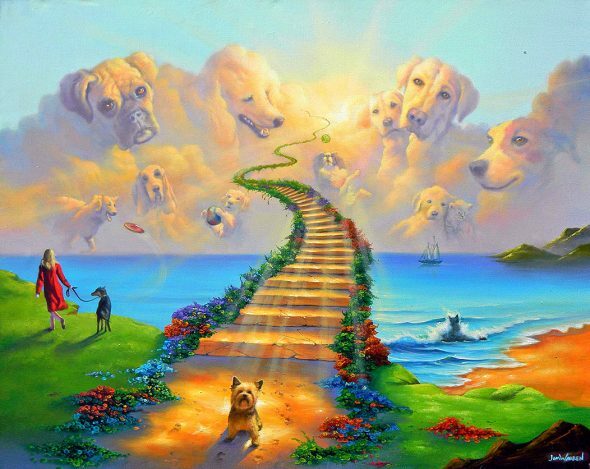 I wonder if there are dogs in heaven. My buddy’s dog of 14 years just passed away and he said he’s cried harder about her than he did when his mentor passed. You spend so much time with them, they’re always there, and when they leave, there’s a huge hole in your life left. I love my dogs, because they are very smart. I’m so sorry for your loss. I work in the pet fashion industry myself and have personally known countless people who have gone or are going through the pain. Nothing can replace your little friend but you can always count on time to heal yourself and cherish the beautiful memories. To all those who have had their lives enriched by dogs and have had to say good bye to them-they are always with you, they never leave you. I still grieve the loss of mine, but know I will be able to see them again and feel their soft fur, their doggie kisses and watch them run and play like they used to. Losing a dog is exactly has hard as losing a friend or family member because a dog is family. Perhaps it can be harder because often the owner has to make that decision, rather than nature or a random event deciding for us. I currently am on the first dog of my adulthood and I’ve had her for almost a third of my life. I have no idea how I am going to handle it when it’s her time to go. Thank you very much for this article, written from the sensitivity. A dog is part of the family and his love is so absolute and his loyalty so great that losing it breaks our hearts. There are no words and his memory will always be with us. i agree with you that losing a dog can be one of the most difficult one has to go through. Very well defined this material really value, I love pets especially dogs, so I started my blog and I will increase it with details and advice on valuable purchases, but more than anything valuable contributions for you and your beautiful pets because out of the material someone should think seriously about our great friends and partners, is not it? I invite you to know my blog and if possible, value my offers are for growth of my project to benefit the puppies of the planet, thanks for reading this article and forget to share and comment, your words will always be well valued! Losing a dog is the most painful thing in the world. RIP YOUR PET… very beautifully written and explained..stay strong.. I concur with you that losing a puppy can be a standout amongst the most troublesome one needs to experience. Dogs are always by your side, and they never (intentionally) do anything to make you upset. They prefer you happy. In a way, they can be better companions than people. They are amazing creatures that impact our lives greatly by just being there. I have not experienced the loss of a dog yet, but my dogs are currently 11 and 4 years old and the first ones I have ever owned. They hold such a special place in my heart and do everything with me. Moving to college is hard because I rarely get to see them but I know that they will show me unconditional love when I get back. If you would like to read my blog post about dogs, visit https://shylasfascinatingblogs.blogspot.com/2018/11/are-dogs-really-mans-best-friend.html and feel free to comment! It’s true, losing a dog means losing my heart. When I lost my doggy, I was so sad. But after 10 days I get back my pet by PawMaw alert. And I am so happy now! 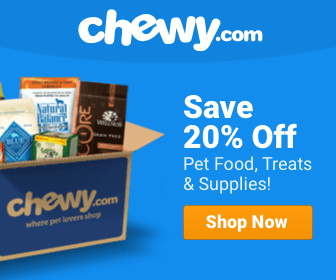 they have a huge collection of bow ties and bandanas for your pooch.